Nationals MP George Christensen gun photo reported to police. "Appalling" photo shared by Nationals MP George Christensen has been reported to police. 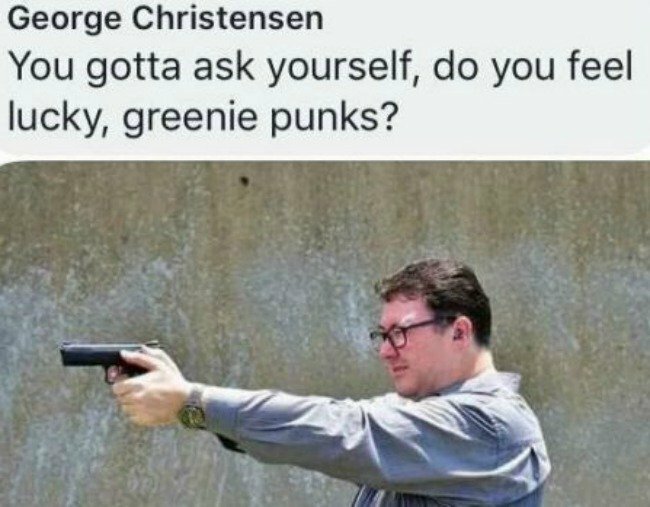 George Christensen has been reported to police by a Queensland environmental activist after the outspoken Nationals MP posted a photo of himself with a handgun on social media. Stop Adani’s Ben Pennings said on Sunday Mr Christensen was an “appalling example” to his constituents and “threats of physical violence to peaceful protesters are particularly unacceptable”. Mr Pennings said he’d added Mr Cristensen’s post to a complaint he filed on Thursday with Queensland police after receiving over 100 death threats online. “I reckon the abusers are ultimately cowards but I’ve gone to the police just to be sure,” Mr Pennings said. Greens Senator Sarah Hanson-Young took to Twitter following Mr Christensen’s post to suggest the Member for Dawson should be sacked. “A Member of Parliament inciting violence against a group of voters should be a sackable offence,” Senator Hanson-Young wrote.